Germany hosted England in the last week of international friendlies before EURO 2016. Joachim Löw continued to disregard Marcel Schmelzer’s existence as the World champions started with a back line of Hector, Hummels, Rüdiger and Can. Hodgson selected a much more predictable line-up and Delle Alli was given his second start as an England international. They say that champions are founded on a strong defensive line. The hosts made a poor start to the game and immediately showed difficulty against England’s press. From Neuer’s goal-kicks, both Rüdiger and Hummels were forced very wide and into positions at times effectively on the byline. As a result, they lacked sufficient space with the ball and their ability to move the ball forwards suffered significantly. Germany’s ball circulation was largely unstable which resulted in many turnovers within their own third during the first 45 minutes alone. Rüdiger’s lack of ability in both construction and playmaking was clear and exposed by England who denied him space and nearby options. The angles of the passes were often vertical which gave some problems as the recipient was facing away from goal and could be susceptible to being pressed from behind and having a restricted ability to then turn. As the game developed, Löw’s side started to look more towards Kroos’ influence to help them progress the ball. The German midfielder started dropping quite regularly after the opening minutes with the intention of using his strong playmaking capacity to break the lines of defence. However due to the issues in collective aspects, this was mostly ineffective and without clear ways to progress the ball with short passes, he resorted to long balls towards the left flank. These were rarely effective and Clyne intercepted many as the speed of the pass wasn’t sufficient, whilst the simple difficulty to begin with made it a challenging task even considering Kroos’ passing ability. One of the biggest causes of Germany’s problems in construction was their weak positional structure. Whilst the two centre-backs took on rather wide positions, Kroos offered for passes alongside Khedira usually on the 2nd line whilst the full-backs moved higher. The spacing between players was a key issue, most clearly down the right where Rüdiger was commonly disconnected from Can as the Liverpool defender moved forward during the build-up. Germany’s disconnect between the first two lines and the forwards higher up. 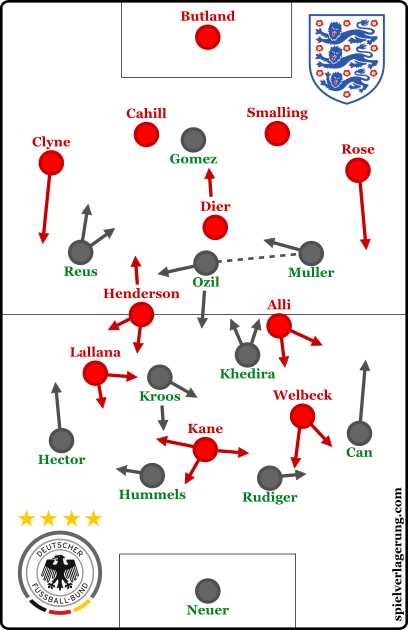 Connections were lacking especially beyond the 2nd line where there became a large disconnect between the likes of Özil higher up which made progression of the ball difficult and was a cause of the numerous ineffective long balls. Not only were there too few, but the quality was also poor through the weak spacing as the angles did not facilitate any potential dynamic combinations to happen. There was also a distinct lack of structural dynamism in many cases. The shape was often static and rigid when the ball was in the first and second lines which made it very difficult for Germany’s ability to manipulate the space through the middle of the pitch. Without sufficient movement between the players, England found it easier to apply pressure through their man-orientations which were quite often uncontested. Overloads and free men were few and far between which made progression of the ball difficult even before considering the lack of technical ability in deeper areas of the pitch. Müller finding space after rotating with Özil. Higher up the pitch, Germany started to improve when there were some seemingly-instructed rotations between positions. Around the 30th minute mark we saw Mesut Özil drift towards the right half-space whilst Thomas Müller moved in the opposite direction to occupy the vacated 10 space in the centre. This shift seemed to destabilise England to an extent, who failed to pick up the German forward and he receive a couple of vertical passes behind the English midfield shortly after the change. However this was far from a solution as Germany’s problems ran far deeper and it’s effectiveness only lasted a short period of time in the context of the game. The ineffective spacing continued higher up the pitch as Özil made a particularly weak performance and had weak movements and positioning in the middle of the German shape. The weak start continued as Germany were poor for the whole 90 minutes. Then, being the masochist that he is, Löw’s introduction of Schürlle and Podolski on the flanks just emphasised Germany’s issues as the away side were clearly superior through the second half. From a less of a tactical perspective, there was simply an issue with the selection and confusing roles with some players. Emre Can was one of the most obvious examples of this as he displayed a weak understanding of his role as a right-back. His movements were often poorly co-ordinated with his teammates and his support for possession through the right flank and half-space was almost non-existent. Defensively he was exposed quite regularly by the wing-oriented movements of Delle Alli who was very impressive in his second start for his country. The most common movements of England’s pressing scheme. For Germany’s deficiencies, lots of credit must be given to England who defended well for large periods of the game. Pressing with clear man-orientations far into Germany’s own third, they gave the reigning champions a significant challenge in their construction and created numerous chances because of it. It seemed that the away side had the intentions of forcing their hosts to build largely down their right side. When Germany looked to build through the left, England remained compact and covered any passing lanes for Hummels to exploit with his excellent distribution ability and Löw’s side were then invited to circulate the ball towards the right flank. Rüdiger is a notably worse ball-playing centre-back than his left-sided teammate Mats Hummels and his aforementioned incapacity to pass the ball with similar effectiveness was exploited. Furthermore, England were then able to expose the inability of Emre Can at right back, especially the lack of synergy in the spacing and movements down the right flank of Germany’s shape. England’s press as a 4-3-1-2. When pressing Germany’s construction they often appeared in a narrow 4-3-3 shape which had common 4-3-1-2 permutations. Welbeck and Lallana took on the highest positions as they tracked Rüdiger and Hummels respectively whilst Kane was slightly deeper in order to cover any German pivot. It must be noted that the distribution of these roles was quite variable and in a number of scenes it was a result of the positions at the end of the previous attack. Because of the man-marking requirements it was common to see the 8s, particularly Alli, push up to track the movements of the German midfield. With a narrow front three and good pressing movements of the midfield, Hodgson’s team had compactness in their pressing and were effective in stopping the opposition from making clean build-up. England’s situational 4-2-2-2 press from the man-orientations. As a result of the man-orientations, something resembling a 4-2-2-2 shape was also possible from England. Welbeck and Kane occupied the first line of pressing and would cover one of the centre-backs each. Alli and Lallana acted just deeper in the second line and would similarly be oriented on covering Kroos and Khedira, with some intelligently-worked situational double-teaming if one of the German pivots made ball-oriented movements. The compactness was one of the bigger highlights of England’s defensive scheme, which became a difficult challenge for Germany to bypass. The intelligent movements of the midfield worked to close out the space through the middle whilst the above-average access in the press allowed them to constantly challenge the German build-up. Yet despite this impressively-coordinated defensive game, England were unable to convert many turnovers into strong shots on goal. Their decision making was sub-optimal and showed a poor understanding at times to take advantage of some dangerous regains high up into Germany’s half. In other instances there was a lack of composure such as in Alli’s second half chance which is difficult to account for. In transition, their movements could have been co-ordinated to a better standard though this was amended to some extent with the introduction of Vardy in the second half. Almost inevitably, the Leicester forward scored his first international goal in a spectacular manner shortly after being introduced by Hodgson. In summary, it was an impressive win for Roy Hodgson’s England side yet not an overly surprising one. Löw’s Germany have been weak for quite a while now with nonsensical selections as in this game Schürrle and Podolski picked up their 50th and 127th (!!!) caps respectively. Take little away from England though who defended very strongly, especially so in Germany’s own third as they acted well in their narrow 4-3-3/4-3-1-2 shape. This competent collective performance was paired with some promising individual showings, not least from Delle Alli who again made a bright performance ignoring his miss in the second half. during the first half Kroos and Khedira were not available as open man for the center backs. After the match Hummels mentioned something that only risky passes would have been possible. I was a little shocked that players like Kroos and Khedira did not grasp that they have to come short to make short passing and a build-up game possible. to be fair, there were no open men when Germany moved up the pitch. Player like Reus and Muller usually possessed the ball and no full-back, and no midfielder came short. Kroos’ long shot goal, and Khedira loop pass assist fits into this sad picture. Germany’s central midfield was very successful to prevent football. I am not surprised that Kross and Khedira are under media pressure in Spain and Italy. Their playing style is not the answer against stronger opponents. I am more disappointed by Kroos as he claims himself to be DLP. England pressed high to prevent the CBs from starting the attack. In this scenario, Kroos or Khedira has to drop back to make themselves available and by pass the press. But they didn’t. Leow’s tactic was for Rudiger to pass the ball long like Boateng does but the problem with this is that Rudiger cannot pass as well and the strikers were not mobile or lack tactical awareness to make themselves available. Germany can expect many teams to adopt the same strategy in the future and Leow has to come up with a game plan to counter this. You are right in saying that the real issue was construction, or more precisely in English – structural. I would argue that the real issue was Low with his hard to comprehend team selection and tactics. Firstly I don’t think it is wise to play Reus and Ozil in the same team. This creates a huge imbalance in the team structure with both players are poor defensively and do not track back or tackle. This exposes the team against quick counter attacks and often leaves the defence without cover. Ozil had a bad game as he gave the ball away many times and in some cases it lead to either a goal scoring chance or even a goal. In the second half. this became a big problem as there was no cover in the midfield area, allowing England to run at Germany freely. It is difficult to understand the selection of Emre Can as the RB for he has failed badly every time he played. He has a poor sense of timing and position. Often he makes the wrong decision and gives the ball away in dangerous areas. The team’s problem was apparent within seconds the game started with Hummels and Rudiger showing a lack of ideas in passing the ball and with England pressing high to deny space. While Rudiger is not a bad defender, however he’s no Boateng. He cannot play the ball out of defence as well or pass accurately over long range. This was compounded by the immobile attackers as well as the ball-watching Khedira and Kroos. Apart from the selection of Can and Reus, I also failed to understand the need for Tah replacing Hummels. With Hummels’ out there was no leadership in the defence and the CBs stopped playing ball out of defence as Tah is no Hummels. This is the start of Germany’s problem in the 2nd half. I am glad that Bastian is unfit as he would have made the midfield even slower and weaker. As much as I admire his leadership skills and contribution, he’s pass his best. 3. Khedira/Gundogan as pivot with Kroos move up AM. Play Ozil and Muller either side of Gomez/Goetze. The last slot should depend on the opponents. In case like England, it can be tactically clever players like Bender, Weigl, etc. I would also like to see Gonzalo Castro getting a recall. For Germany, the double pivot Kroos/Khedira does not work. I would see them higher up in a 4-3-3. But who could play holding midfielder then as long as Schweinsteiger is absent? Furthermore, staffing of full backs not ideal, would rather see Durm/Schmelzer.